Everybody would admit that a false or malicious criticism had better never have been written. Everybody, too, would be willing to admit, as a general proposition, that the critical faculty is lower than the inventive. But is it true that criticism is really, in itself, a baneful and injurious employment; is it true that all time given to writing critiques on the works of others would be much better employed if it were given to original composition, of whatever kind this may be? that men may have the sense of exercising this free creative activity in other ways than in producing great works of literature or art; if it were not so, all but a very few men would be shut out from the true happiness of all men. They may have it in well-doing, they may have it in learning, they may have it even in criticising. Nay, they are more within the control of the critical power…Thus it tends, at last, to make an intellectual situation of which the creative power can profitably avail itself. It tends to establish an order of ideas, if not absolutely true, yet true by comparison with that which it displaces; to make the best ideas prevail. Presently these new ideas reach society, the touch of truth is the touch of life, and there is a stir and growth everywhere; out of this stir and growth come the creative epochs of literature. A stirring defence of criticism – that branch or area of literary endeavour which most of us who blog about books (mostly, in my case, at least) are humbly and earnestly – and honestly – engaged in, searching to find ‘the touch of truth’. 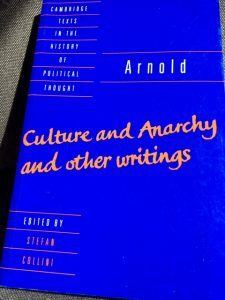 The quotations are taken from my copy of Matthew Arnold: Culture and Anarchy and other writings. Cambridge Texts in the History of Political Thought, ed. Stefan Collini (CUP, 1995). My quotations from ‘The Function of Criticism at the Present Time’ are at pp. 26-29. This entry was posted in Readings and tagged Criticism, Matthew Arnold, The Function of Criticism at the Present Time by Simon Lavery. Bookmark the permalink. Very timely, in that we are struggling in the fog of a “post-truth” administration at the moment and it can be exhausting and disorienting. Simon, the world would be a thinner gruel without your bloggins’!! It strikes me that another great aspect of criticism is its usefulness as an aid to curating. With the vast glut of material available on-line, a well-informed, fine sensibility can be a real tonic. Honest criticism helps artists as well. I remember your mention of the excess of polemics in a novel you reviewed. Since polemics can weaken the power of a novel to become a seamless world in which the reader can disappear, and then come to his or her OWN conclusions, I think that was a valuable observation. If I wrote something, and someone pointed this out to me, I would welcome it! Liz: I know he’s way up of fashion now, but his notion of literary touchstones is what I was brought up on, so I take him pretty seriously.